Failure to recognize the Subcentral TIPNIS as holder of title for the territory and as representative of its indigenous peoples, and failure to include “this organic structure of the TIPNIS communities” in the “elaboration, execution, and fulfillment of a an integral plan for sociocultural protection and sustainable development” proposed in the legislation. Doubt about the willingness of the government to carry out its constitutional and international obligations to comply with consultation when it has failed to do so in other instances. 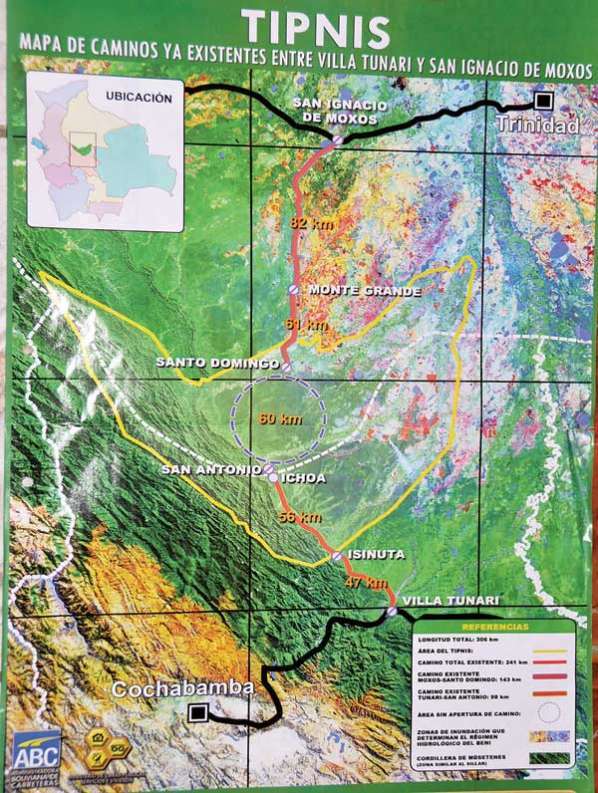 A map from the Bolivian Highway Administration illustrating the road project from Villa Tunari to San Ignacio de Moxos. The boundaries of TIPNIS appear in yellow.